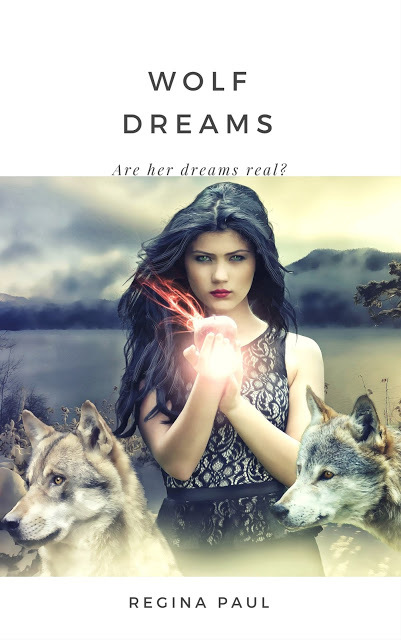 Speculative Romance Author Regina Paul: Free Serial Romance: Wolf Dreams Part 6 404 ~ Page Not Found! I don't know where I am...I know I'm dreaming again but I don't recognize this landscape. Unlike the other dreams where I see Sarah, this landscape is barren and dead looking. There is nothing for as far as I can see but a flat brown landscape with black skeleton trees whose branches reach towards a black sky. I don't like this place and I want nothing more than to leave it, but there is a reason I'm here, there has to be. As with my other dreams, I am hyper aware. I begin walking though I have no idea where I'm going. There is nothing I can see other than the black, dead trees that look as though a good stiff wind will uproot what little is left of them beneath the dusty brown ground, knocking them over to lie looking even more dead if that were possible. There are no stars in the black sky, and I'm surprised I can see as there does not seem to be any light sources and yet I can see as though I were walking at home on a gray day with rain falling down. I would give anything to see a set of clouds heavy with rain. In my imagination it would wash the heavy, dusty brown earth away to reveal soil live with the richness of the possibilities of growing things. The rain would decompose the dead black trees returning them to the soil buried beneath the ugly dead looking brown earth. In my mind's eye I can see the live soil beneath it, rich with small lights that I somehow know are very small crystals. This soil speaks to me, singing a song only I can hear. How can I hear it? You have always been able to hear the song of the true earth. The voice is soft, but it isn't Sarah's voice, this is someone else. Who are you? I think, somehow knowing she will hear me. It is not yet time for you to know me. Just know that this place is what the dark fae would create for himself and those like him in both my world and yours if he is not stopped. Do you mean the false face? I think to the invisible presence. There is a pause, a deep breath which I can hear before an answer comes. Yes. Who is this new person entering my dream universe and why will she not identify herself? I don't like it. Too much has been happening to me lately for me to trust anything or really anyone. Except maybe Sarah, Pokey and Darius. For some reason I know I can trust them. Is Sarah okay? I mean I may as well ask her since she's revealed herself. Suddenly into the dead brown land a heavy wind rolls through the landscape pushing what looks like tumbleweeds that are four times the size as those I could find in the waking world, more brown dust, and what looks like trash. Wrappers, old papers, empty pop cans and more. And it's heading right towards me! Sarah is mine! The same sinister voice I'd heard before, ominous, filled with gravel and hostile answers, as though to shout over any answers the other voice might give me. Anger surges through me. No she's not! She's mine! I open my mouth to yell the words when I begin to hear a sound off in the distance. It's my alarm clock in the waking world. My eyes pop open and then close again as glaring daylight nearly blinds me. I reach over and slap the snooze button on my clock. I crack one eyelid slightly open and look at the clock. It's six am and I'm going to be late not only for class, but for my first lesson in how to turn any mirror into a portal. Do I have a new ally or is this just a trick of the false face? But then why would he tell me what his plans are to make both the fae world and my world a barren dust bowl where nothing can live?